Kurulin Fusion Or A Ham Sandwich? 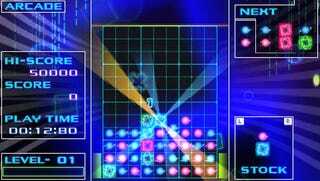 MTO USA's PSP puzzler Kurulin Fusion combines "futuristic graphics" with a musical score directed by Final Fantasy composer Nobuo Uematsu, and it's available later today on the PlayStation Network. MTO USA's marketing pitch? "Have fun. Don't eat." Being a big Nobuo Uematsu fan myself, MTO USA doesn't really have to market a $4.99 downloadable PSP puzzle game featuring his work in my direction. Were I not a fan, however, MTO USA marketing guy Scott Pelland would have had me at "ham sandwich." Pelland hypes up Kurulin Fusion in a post on the official PlayStation blog. Did I mention that the game is now available for a mere $4.99? Let's put that into perspective. That's less than the cost of a ham sandwich here in Seattle. So, the question really is this; would you rather play an engaging game with world-class, imaginative music and endless replay value…or have a sandwich? I vote GAME, and I've been a huge freaking sandwich fan for years - but I'd rather have fun than be fat. So that's our marketing message: Have fun. Don't eat. I'd discuss the game's mechanics, it's earlier incarnation filled with cute doggies, and the Johann Sebastian Bach connection, but Pelland does it all so much better. Read all about Kurulin Fusion at the link below.